TriMet is taking some big steps this week toward improving the ticket system for our riders: Beta testing of the highly anticipated TriMet Tickets mobile ticketing app ends so final adjustments can be made before the public launch; and, a new ticket printing system debuted on TriMet buses today. 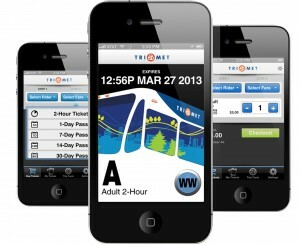 More than 150 riders have been putting the TriMet Tickets app to the test since May 16. Since that time, more than 2,000 tickets and passes have been purchased with the app, which makes buying and using fares easy and convenient. The beta testing ends on Sunday, July 7. After some fine-tuning by our partner GlobeSherpa and our team, the free app will launch to the public sometime in August. Once available, you’ll simply download the free app to your smartphone, enter your credit or debit card information into the secure system and then buy and use the fares with just a few taps of the screen. Testers have been delighted at just how easy it makes riding TriMet. No searching for loose change. No additional steps for purchasing tickets. It’s all right there on their smartphones. Today we launched a new ticket printing system on all TriMet bus lines. 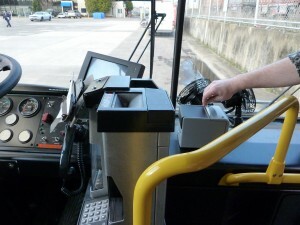 An onboard ticket printer located to the right of the fare box produces tickets that are easier to read and more durable compared to the thin, newsprint transfer slips riders have been use to getting from operators. Just put the necessary fare into the fare box for either a 2-hour ticket or a day pass, the bus operator presses a button on the console for the corresponding fare and voila, the ticket prints and pops up out of a slot on the top of the ticket machine for you to take. As with anything new, we’ve experienced some minor issues such as with loading the paper and power to the console, but we’ve quickly worked to resolve those and so far day one of the ticket printers is going well. This is a transition to the new technology, so bus operators have tissue transfers on hand in case they are needed.